The latest Digital RX series incorporates electronic know-how combined with high manufacturing quality at affordable prices. Highlights such as feature control via computer, remote control with the EL-Skyport App for iPhone™, iPad™ and iPod Touch™, ultra stable circuitry for consistent flash power, low sync voltage to protect digital cameras are just some of the many advantages of these series. The latest Digital RX series incorporates electronic know-how combined with high manufacturing quality at affordable prices. Highlights such as feature control via computer, remote control with the EL-Skyport App for iPhone™, iPad™ and iPod Touch™, ultra stable circuitry for consistent flash power, low sync voltage to protect digital cameras are just some of the many advantages of these series. 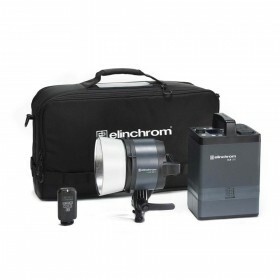 The pack includes a sync cord, but with the addition of the EL-Skyport (sold separately), radio remote control and triggering is also possible - Adjust power and switch on/off the modelling lamp with the Skyport Transmitter speed and the Transceiver RX, right from the camera.